Beautiful and Functional! Great gift for those who have it all. 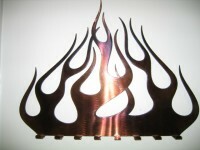 Metal Flames Keychain Holder. Ready to hang with eyelets already attached to the rear of the piece.